Hi and welcome to a slightly later than normal edition of Comics you should be reading! This week we’re looking at All-New X-men #7. 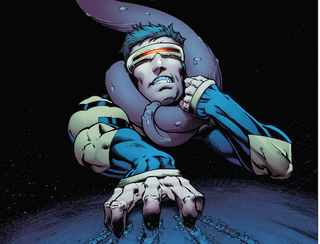 Generally, I dislike most X-men comics. I am now prepared to eat my words. The reason for my general dislike of the series is that it focuses much of it’s time on it’s past greatness. It retreads the same major beats over and over again. I like the allegory the original series tried to convey to everyone, it was a message that needed to be heard and it made for some of the greatest comics ever, BUT the X-men needed to move forward. It needed to cover new ground and for the past few years it hasn’t been. Speech Bubbles Removed to Avoid Spoilers. Also BAMF! With the arrival of the All New X-men, I thought it would be more of the same. Here Bendis was, bringing back the original team from the 60's and plopping them in modern times. It made for an eye roll from me that an angsty teen would be proud of. Then I cracked the book and all of the preconceived notions that I had about the concept were thrown out the window. The book has become about a group of young people forced to make difficult decisions in the world with the foreknowledge of who they become in the future. They interact on a wholly different level than the original cast of the X-men and with Scott’s role *SPOILER FOR SCHISM WHICH IS REALLY OLD, SERIOUSLY NOT REALLY A SPOILER ANYMORE, AND SECRET WARS WHICH KINDA IS A SPOILER I GUESS* as a giant douche and leader of his own band of X-men right up until his death in Secret Wars, it really makes for a compelling group of young characters. This issue in particular is pretty fantastic. In it, they have made Toad a sympathetic, but also rather frightening villain. Which, if you had asked me if that was possible I’d have laughed at prior to reading this. The framing of the issue was very well done, with a lot of claustrophobic feeling close ups and some stellar rendering of cyclops, but if there was one issue it was that the art stumbled a bit when it came to Toad. I would have had a much easier time feeling attached to the villain if he didn’t look like a drunk green man trying to be a member of the Beatles. In a sentence, the comic felt like a tightly paced thriller, with Scott facing a situation that makes the reader feel claustrophobic. There’s some good characterization in here, some bad art in facial features, and some great panel layouts.